Veteran Trader: Market Sell-Off Could Continue if Trade War is "Semipermanent"
The Dow Jones Industrial Average fell for a second straight day, posting a 190-point loss on Tuesday following an 83-point decline the previous day. The Dow was down 30 points in early trading on Wednesday. Furthermore, the severity of a sell-off would depend on how long the trade war continues–to Cashin, the longer, the deeper the sell-off. 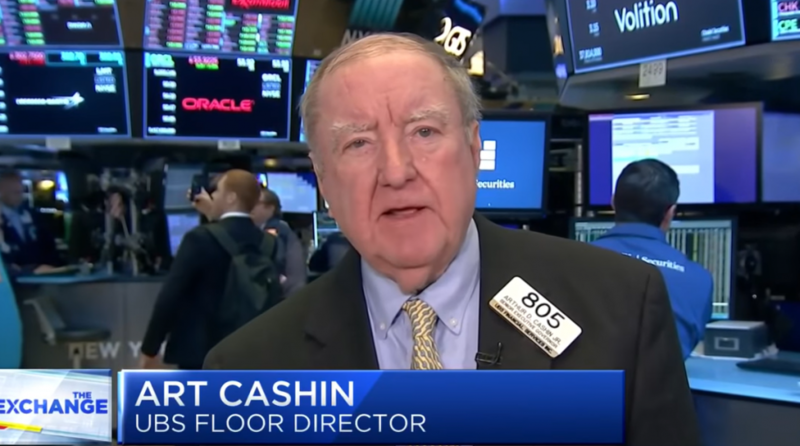 “If it looks like we are looking at two years or something like that, with us going nose to nose with some major trading partners, then I think the sell-off could be more severe,” Cashin added. Should those estimates hold up, it would represent the first profit reduction for the S&P 500 since the second quarter of 2016. With analysts expecting a decline in earnings, focus falls on corporate guidance for the rest of the year, which could help temper any investor fears. Adding to the market fretting is the IMF cutting its global growth forecast to the lowest level since the financial crisis, citing the impact of tariffs and a weak outlook for most developed markets. According to the IMF, the world economy will grow at a 3.3 percent pace, which is 0.2 percent lower versus the initial forecast in January. In addition, the global volume of trade in goods and services will increase 3.4 percent in 2019, which represents a drop from the 3.8 percent gain last year. The IMF, however, did mention that recent policy implementations like the U.S. Federal Reserve keeping interest rates steady are positive signs moving forward.